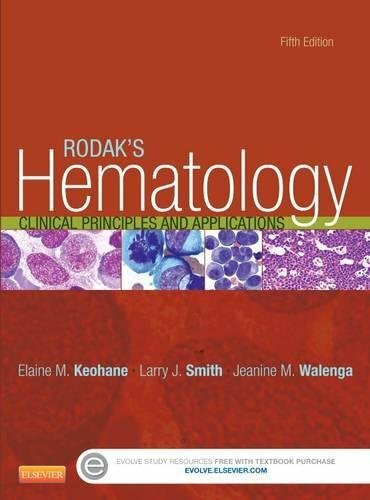 Featuring hundreds of full-color photomicrographs, Rodak’s Hematology: Clinical Principles and Applications, 5th Edition prepares you for a job in the clinical lab by exploring the essential aspects of hematology. It shows how to accurately identify cells, simplifies hemostasis and thrombosis concepts, and covers normal hematopoiesis through diseases of erythroid, myeloid, lymphoid, and megakaryocytic origins. This text also makes it easy to understand complementary testing areas such as flow cytometry, cytogenetics, and molecular diagnostics. Clinical lab experts Elaine Keohane, Larry Smith, and Jeanine Walenga also cover key topics such as working in a hematology lab, the parts and functions of the cell, and laboratory testing of blood cells and body fluid cells.